We're frequently told that a dog is man's best friend  but not if that man happened to be Osama bin Laden. One of the overlooked story lines in the remarkable operation carried out by the American commando team that went to Pakistan and killed the al-Qaeda leader in the early hours of May 2 is the role played by the only member on four legs. Wearing canine armor, the trained military dog, believed to be either a German shepherd or a Belgian Malinois, was attached to a human SEAL and lowered from a helicopter into the compound in Abbottabad. He had the ability to sniff out hidden explosives and find any secret rooms of bin Laden's. And if any of the bad guys had tried to escape, the dog could have easily given chase, seeing as a shepherd or a Malinois runs twice as quickly as humans. 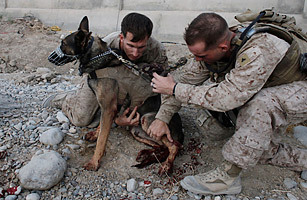 If the dog ever needs a reference, it doesn't get much better than having the following remark on your résumé, courtesy of General David Petraeus, then commander of U.S. forces in Afghanistan (he's also said the military needs more dogs): "The capability they bring to the fight cannot be replicated by man or machine."